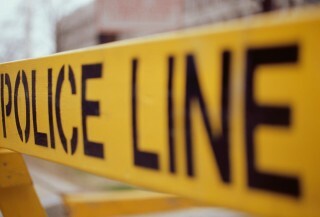 A file image of crime scene tape. Pacifica police arrested two men on Saturday in connection with a recent car theft in San Francisco. Officers arrived at the 400 block of Inverness Drive after receiving a tip about an unresponsive man. Police said they found Neville Roebuck, 24, of San Francisco, lying seemingly unconscious next to a white 2015 Subaru Impreza. Another suspect, Konrad Derheim, 23, also of San Francisco, was at the scene and admitted to having some connection to the car, police said. Police said they discovered that the car was recently stolen out of San Francisco. After being treated by medical personnel at the scene, Roebuck was arrested and taken to San Mateo County Jail on charges of possessing a stolen vehicle, possession of a controlled substance and for possession of drug paraphernalia. He was released on Sunday after posting $25,000 bail. Derheim was also arrested and taken to San Mateo County Jail, where he was charged with possessing a stolen vehicle, police said. He was released on Sunday after posting $60,000 bail. It was not immediately clear if either suspect had a lawyer. Both are scheduled to appear in court on November 24.